Do not miss this months Bingo – Family Fun Night!!! 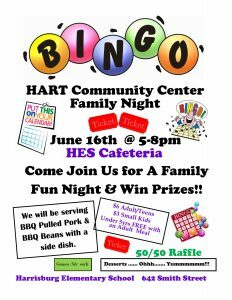 Bingo will be on June 16th from 5-8 p.m. There will be BBQ Pulled Pork and BBQ Beans with a side salad. Bring your friends, neighbors and relatives!! Tell everyone… Tickets are only .50 cents each per card per game. Meals are $6 Adult/Teen, $3 children 6yrs – 12yrs and children 5yrs and under are free with a purchase of an Adult meal. Join us for a great time and win wonderful Prizes… You can also play in the 50/50 Raffle. You just may be the WINNER! !